Click on the image for a legible view. 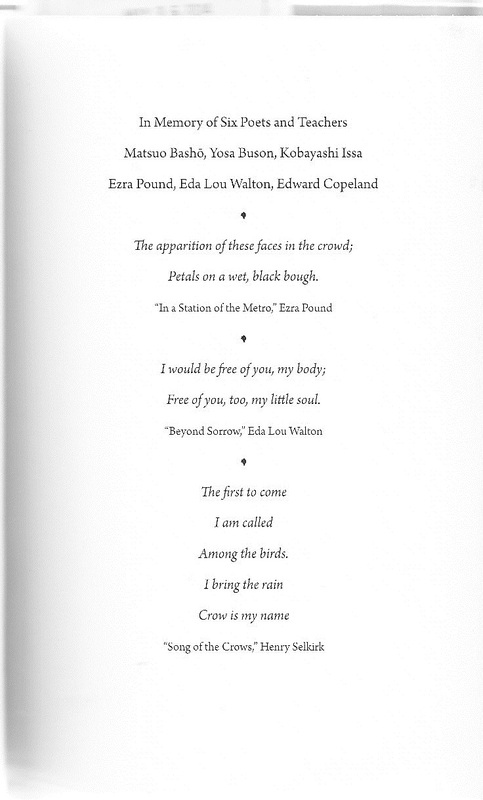 Interesting to see Ezra Pound acknowledged as a teacher by Gerald Vizenor, who includes him on the dedication page of Favor of Crows. The page also includes “In a Station of the Metro” as an epigraph. Haiku scenes are tricky fusions of emotion, ethos, and a sense of survivance. The aesthetic creases, or precise, perceptive turns, traces, and cut of words in haiku, are the stray shadows of nature in reverie and memory. The original moments in haiku scenes are virtual, the fugitive turns and transitions of the seasons, an interior perception of motion, and that continuous sense of presence and protean nature. Haiku was my first sense of totemic survivance in poetry….